Some plants provide ready tinder for wildfire. Others hold their own in high heat and drought and resist fire. 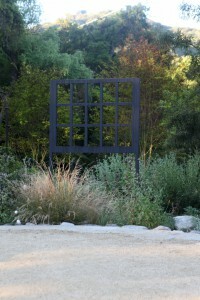 California Native Plant Society, September 2012. By Roger Klemm: Fountain Grass (Pennisetum setaceum) is a bunchgrass from Africa that is widely planted as an ornamental plant in portions of the United States with warm winters. It is a tough, vigorous plant that will tolerate adverse conditions of heat and drought. It does not appear to suffer from any pests or diseases, and many people appreciate its graceful seed heads produced in profusion over the spring and summer months. September 30, 2017. By Cassy Aoyagi: Her beautiful, sparkling gold feathers flow like cornsilk in the wind. The movements of her curvy shape can mesmerize. The power of Fountain Grass is obvious. No doubt, she’s one of the more popular grasses in LA. We aren’t fans. Pretty can get you pretty far, and she is that. Her advocates make Fountain Grass sound friendly too. They’ll go so far as to call her drought tolerant! Well, that’s technically true. (But it’s the Regina George kind of tolerant.) If we take the time to look beyond her surface beauty, Fountain Grass is nothing but the ultimate mean girl. Lest you think I’m just jealous of her looks, check out what Roger Klemm has to say about her. I’d like to nominate another homecoming queen, the equally pretty and far more generous Deer grass. We know, Fountain Grass is pretty and popular. But at some point, don’t we all have to ask ourselves what kind of friends we want to invite to our homes? By Cassy Aoyagi: Both Stipa tenuissima and Aristide purpurea grasses provide vertical visual interest and tendrils that will wave in a breeze. In addition, both actually perform without much water. Curious as to how Stipa earned its seat on the [wet-to-dry] exchange? A clue: Stipa’s seeds place it in the same category as Pennisetum and Pampass grasses – invasives that are nothing but trouble! Provides the same height and texture. Aristida is a very light and airy textured grass that reaches the same height as Stipa, with a narrow and upright form. Pops with PURPLE seed heads. What could be prettier! When in seed, Aristida purpurea takes on some of the “blonde” colored qualities as the Stipa, but the contrast of the purple seed heads is glorious. It won’t get as thick as a Stipa, but you can counter that by planting more clumps of it to make your point. Holds its looks in the long term. Very low water, Aristida purpurea grass will look its best during the warm seasons, but being a perennial, will hold its own year round. Is hassle-free. It may enjoy your admiration, but it won’t require much attention – just a little cut back toward the end of summer. 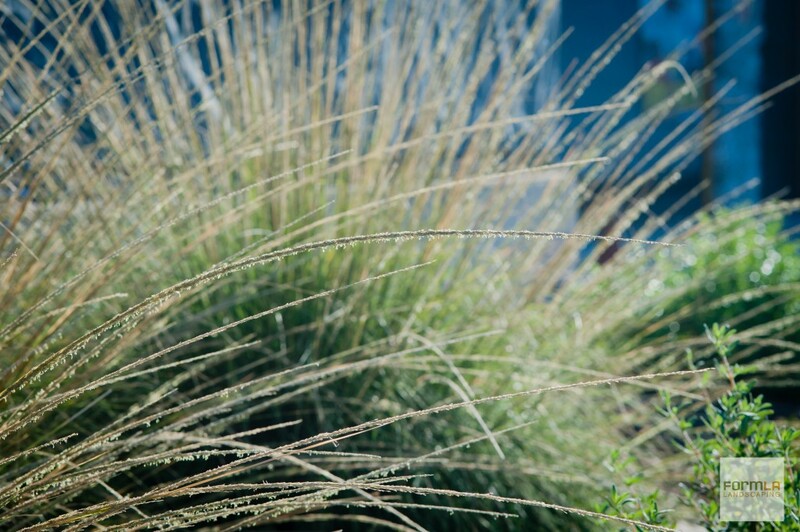 Pair Aristada with companions and materials that will not overwhelm it and with colors that will contrast nicely against it, like, Festuca idahoensis,Carex tumilicola, Carex glauca or Artemisia ‘Canyon Grey’ or ‘Davids Choice‘. Create fire danger. While they outperform natives during the good times, invasives tend to dry up when the going gets tough. The more invasives we have in our hills, the more we exacerbate the fire, flood, slide cycle. Can’t stay put. By definition, an invasive is a wanderer that will quickly leave its spot in the garden to explore the rest of your landscape… and California hillsides. Repel wildlife. Invasives often outperform the native foliage, leaving native species of wildlife bereft of sustenance and shelter. By Cassy Aoyagi: Two plants provide plumes of white that look like large sticks of cotton candy peppering California hillsides. Don’t be fooled! Both have spikey foliage capable of taking a good bite out of you! One is native here and throughout much of the warm-weathered U.S., and it is well adapted to fight drought and fire. The other invaded our hillsides and bears responsibility for a good share of Los Angeles’ fire, flood, slide cycle. Which will you choose to have in your garden?